The *real* Bella sisne. Because we all know that it was what Stephanie Meyer was thinking.... Wallpaper and background images in the Critical Analysis of Twilight club tagged: twilight anti critical analysis stephanie meyer bella swan. This Critical Analysis of Twilight fan art might contain portrait, headshot, and closeup. 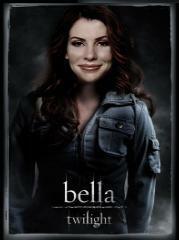 STEPHENIE MYER IS BELLA!! SO TRUE!!!!! >xDDD Kudos to whoever photoshopped this so well. Er, I mean FOUND this.